Might you be just the person we are looking for? Interviews during the second week of October. 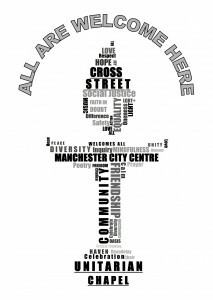 Cross Street Chapel is deeply saddened over the bombing last night at the Manchester Arena. We send Prayers to all who have lost loved ones, all who have suffered injuries, and all affected by this horrific attack. We are grateful for the support and prayers sent from across the world, and the response of our emergency services at this time of crisis. Manchester is a community that responds to adversity with fortitude and pain with compassion. As we grieve, we grieve together. This spirit builds stronger bonds that even the most horrific act cannot untie. The chapel will be open today for anyone needing space, silence and prayer. Wherever you are, however you hurt, may you feel held and loved. 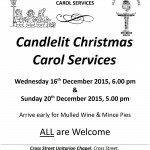 Looking for a festive sing? 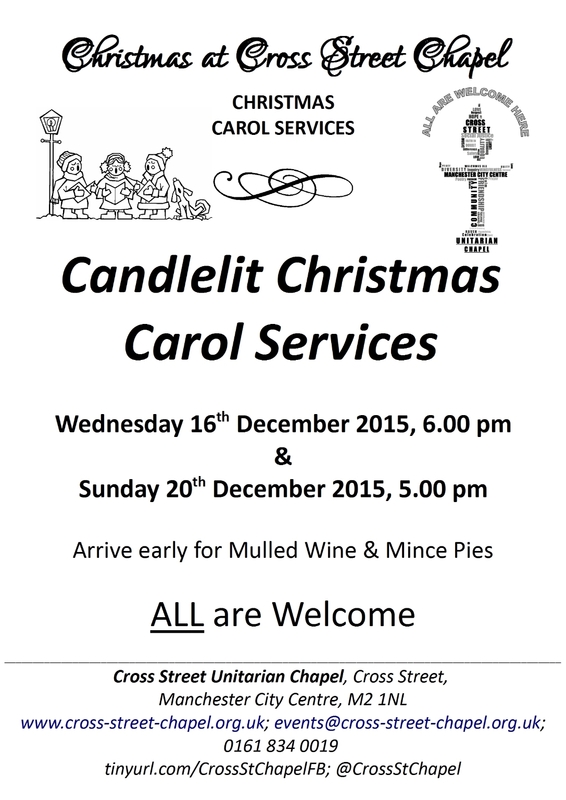 Cross Street Chapel brings two services of carols and readings this month! Join us at 6 pm on Wednesday the 16th, or 5 PM on Sunday the 20th, to sing, hear inspirational readings, listen to beautiful music, and enjoy the warmth of love and community. Better yet, arrive half-an-hour early for drinks and mince pies! Cross Street is proud to announce the return of “Anthems for Advent,” the annual celebration of music and theatre that begins our festive season. Please join us at 1PM on Friday 27 November for music and mince pies. Free admission, all are welcome! Cross Street Chapel is shocked and saddened at the death of Natalia Strelchenko. She was for a long time our “pianist in residence” and had performed here on numerous occasions, including recitals and services. Her music brought great joy and profound beauty to many over her years in Manchester. 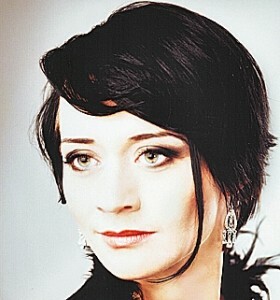 Natalia shared with us not only her musical virtuosity, but other interests, such as painting. She was passionate about bringing world-class music to wide audiences. We have seen few people with such passion, laughter and joy in life and performing as her. We have felt blessed to have known her, and heard her play, and now we mourn the world’s loss of so skilled a musician. She will be remembered not only for incredible virtuosity, but also her zeal and passion for life. In our mourning we hold her family and friends; may they be in our thoughts and prayers. A recital in her honour is being planned, and more details will follow when available. 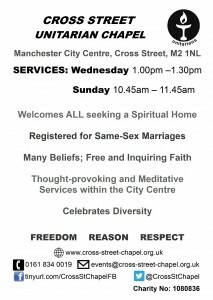 Welcome to the web site of the Cross Street Unitarians. There has been a Unitarian chapel on the Cross Street site for over three hundred years; we are now in our third incarnation, which is a simple, round, white chapel, at the base of a modern office block. 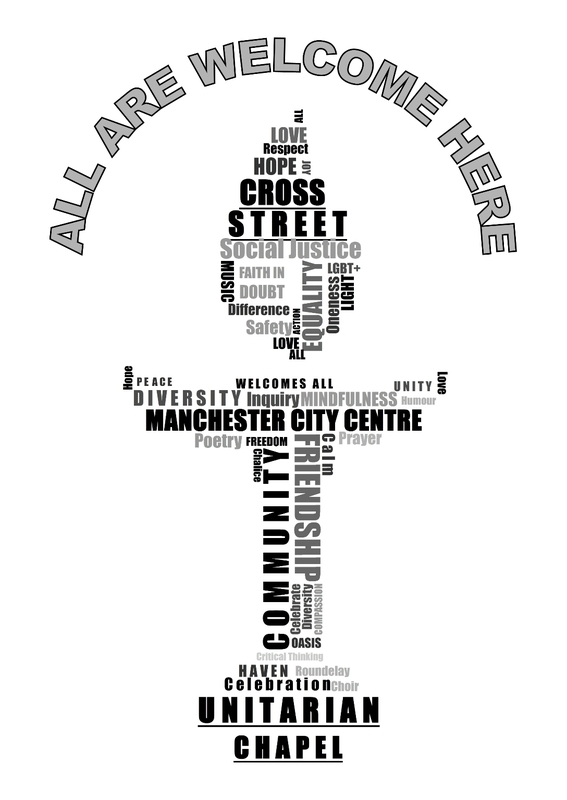 Unitarians are non-credal, meaning we do not have a central set of beliefs we ask anyone to subscribe to: indeed, there is a very wide diversity of belief at Cross Street, which you’ll see if you check out our Members’ theology page. Some believe in God, some don’t. Some believe in life after death, some don’t. Some are just unsure. It doesn’t matter. We are bound together by love and respect, not a shared creed. We draw on the teachings of Jesus the man as well as the other major world faiths: we also draw on the accumulated store of human wisdom as expressed in art and science, the humanities and personal experience. For us, divine revelation and human learning are a never-ending process. We are a lively, inclusive community: you’ll be most welcome at one of our services, which are normally held 13:00-13:30 on a Wednesday and 10:45-11:45 on a Sunday, with tea and coffee afterwards (please do check our calendar page before setting off, as well as directions on how to get to us). This may be the spiritual home you have been looking for: we hope to meet you soon.